Newspaper Rock: "War paint for today's business world"
New Billboard for Florida State’s MBA ProgramFlorida State University (home of the “Seminoles”) has unveiled a new billboard for their MBA program. I always wonder how these types of things make it through so many layers of approval. Kirsten who sent it over said this has been their slogan for awhile, apparently. Associating business school with Seminole Indians and warpaint is stereotypical, of course. Interest Convergence, FSU, and the Seminole Tribe of FloridaLive and learn. I guess the “quick post” model failed–you should see my inbox. Guys, I know the Seminole Tribe of Florida has worked with FSU and offered their approval of the mascot and associated images. I know quite a bit about the relationship, actually, and I’ve been learning quite a bit more in the last day or so…thanks to the strongly worded responses from some passionate FSU fans. Florida State has been the “Seminoles” since 1947, and have had a “relationship” with the Seminole Tribe of Florida for many years, but it was solidified more recently. In 2005, the NCAA passed a resolution, calling Native American Mascots “hostile and abusive,” and prohibiting schools with these mascots from hosting post-season events. The Seminole Tribe of Florida then officially gave their permission to use Osceola as the mascot, letting FSU get a waiver from the NCAA rule. I work in Florida State University’s Office of University Communications. We’ve become aware of your recent blog post about several of Florida State University’s recent promotions which include Seminole imagery and symbols—and appreciate your concern. However, we wanted to take this opportunity to make sure you were aware that the relationship between Florida State and the Seminole Tribe of Florida is one of mutual respect. In 2005, the tribe passed a resolution supporting the university’s use of the Seminole name, logos and images, including Osceola and Renegade. This was recognition of Florida State’s continued collaboration with the tribe, including prominent participation by tribal members in many of the university’s most meaningful events, and our seeking advice and direction to ensure tribal imagery is authentic. Simply put, Florida State University is humbled and honored by the privilege of representing a group of people whose courage and spirit we admire and respect. Through the years, our administrators have made it clear the university will not engage in any activity that does not have the approval of the Seminole Tribe of Florida. Did the Seminole Tribe really examine this particular image and declare it "authentic"? Based on what, exactly? 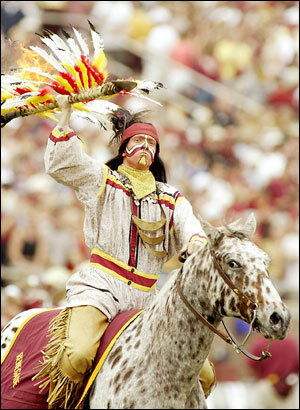 Or did they give permission in general for FSU to do whatever it wants with the Seminole name, mascot, and imagery? The warpaint, spear, horse, and name (Osceola wasn't a chief) are all phony. The Seminole Tribe's approval conveys one of two things. Either these items aren't stereotypical, according to the tribe, or they are stereotypical but the tribe doesn't care. Those are two very different positions to take. Until the tribe explains how these items aren't stereotypical, it's safe to assume they are. That means they're causing the same harm as every other one-dimensional "savage" stereotype. The tribe's approval doesn't change that. The other Seminole tribes in Florida and Oklahoma haven't given FSU a pass. I don't think we need to either. If something is false or stereotypical, it's wrong, period.P.S. Adrienne gave my website a nice plug in turn:Rob Schmidt just shared this resource in the comments of my FSU post, and I had to share. This is awesome.For more on FSU's Seminoles, see Seminole Fan in Plains Headdress and Chief Osceola Is "Respectful"?